This is just a quick and easy post to show you how I do my eye make up. I always try and think of Nina Dobrev from Vampire Diaries (surprise, surprise). To start with, apply the eye shadow from the Natural Collection Duo pot called Latte. Evenly spread this on the lid but focus on the brow bone area - this will be a highlighter. Next, take a blending brush and gently put the brown coloured shadow called Mocha in the outer corner of the eye. Make sure you blend carefully and if there is fallout from the shadow, hold a tissue under the eye. As you can see from my picture, I’ve kept the eye shadow lighter in the inner corner of my eyes. The next step is to add the lashes, Superdrug’s 2True lashes for £1.99 are perfect for a natural look but they still add length. Then apply the liquid eye liner by Miss Sporty to make the lashes blend with your own lash line. I featured the Vaseline and brow pencil to tell you that shaping your brows is just as important when creating a smokey eye look. Gently dab a small amount of Vaseline onto the brush, and then neaten your brows. 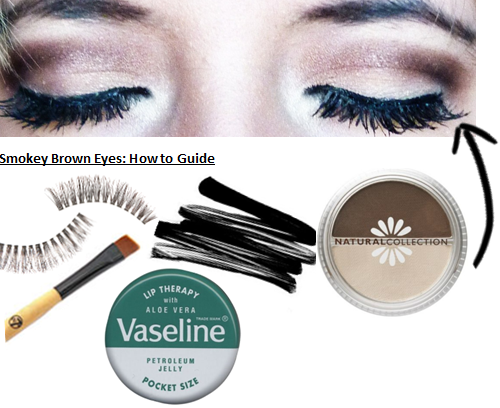 Then voila…quick and easy brown smokey eyes! Hope this short tutorial helped girls. I’ll list the products and price down below. I love it, I do something similar but I'm going to try this look out! And I love that eye look! I don't mess around with brown smokey eyes much anymore, but this makes me want to drag the colors out again! The Vampire Diaries - my guilty pleasure. Love love love Vampire Diaries. Can't wait for tomorrow night!